Exactly who can take credit for originally coming up with the idea of combining tart apples with sweet and chewy caramel is unclear. Recipes for caramel candy date all the way back to the early 1700s. Caramels were first mass produced and marketed to the public in the late 1800s. Dipping apples in melted caramel is believed to have become popular at around the same time. Dan Walker, a 1950s sales representative for Kraft, came up with the bright idea of printing caramel apple recipes on bags of Kraft individually wrapped caramels. Thanks to Walker's ingenious marketing ploy, sales of Kraft caramels exploded, and homemade caramel apples started popping up in kitchens all across the country. 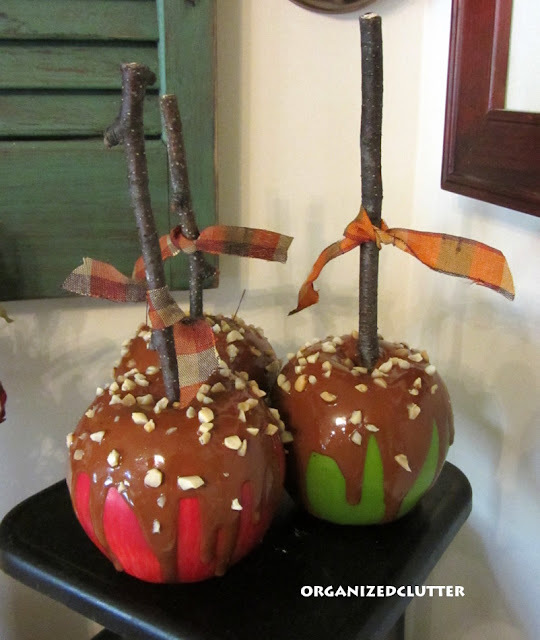 Families would insert a wooden stick, often supplied in bags of caramels, into the center of the apple. 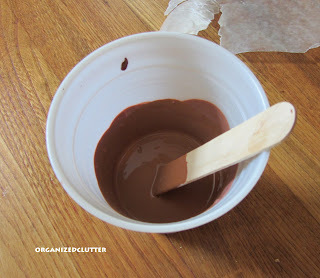 This stick could then be used to dip the apple into the melted caramel. Whatever the history, the combination of apples and caramel and maybe nuts is wonderful, a perfect combination. 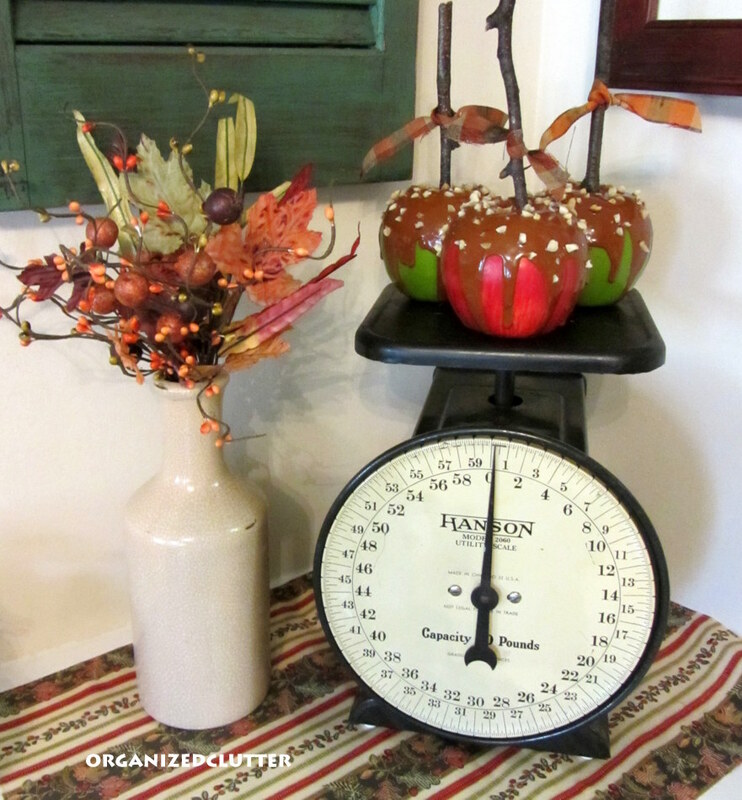 And since apples tend to come into season in the fall, what better time to celebrate with caramel apples than harvest and Halloween. 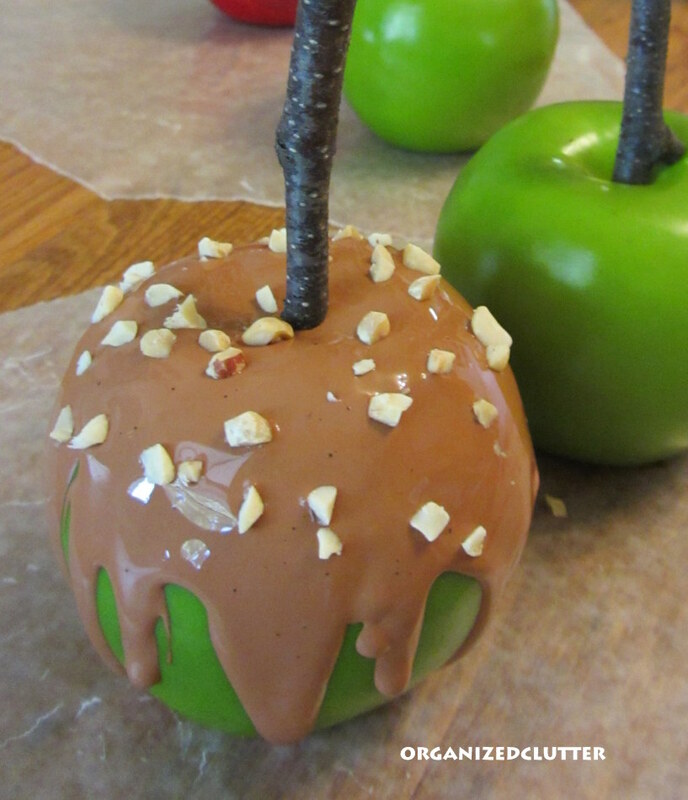 I made some caramel apples yesterday. Sort of. 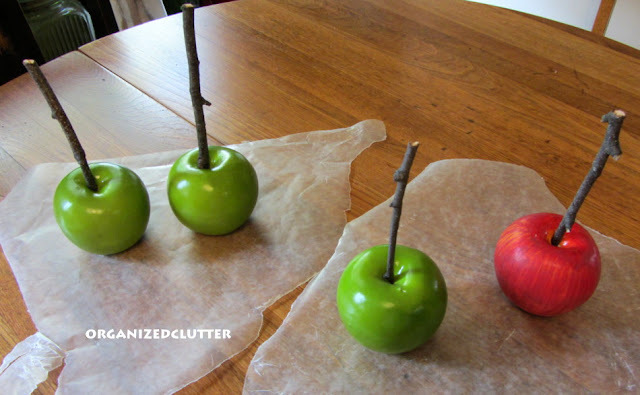 I took four Dollar Tree foam apples, pulled out the stems, pushed birch sticks from my yard in the tops, and set them on wax paper. I saw various recipes for faux caramel apples on the internet. Many called for corn cob litter for nuts, but I used real nuts. Unsalted and non-roasted. Ceramcoat in both Raw Sienna and Burnt Sienna, and Gloss Mod Podge. 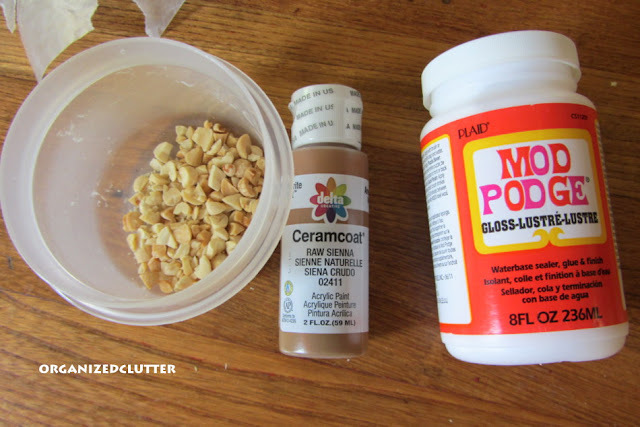 I mixed about half a bottle of Mod Podge with about 1/3 bottle of burnt sienna per one recipe, but decided it was a little too red and added a few squirts of raw sienna. It's easiest to use a plastic spoon to apply and let it run down the sides. I then added the nuts. Just dropped them on with my fingers. I finished them all off and then set them on a clean sheet of wax paper to dry overnight. 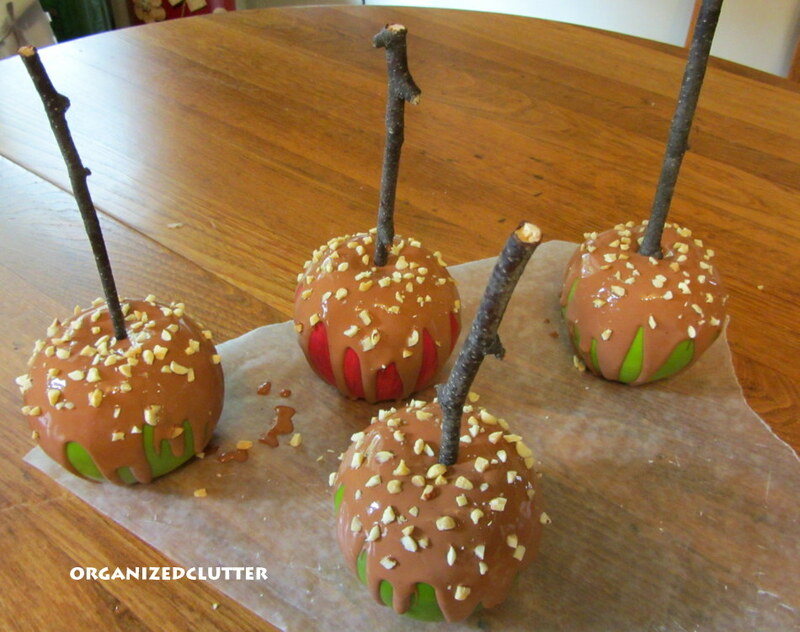 This morning the apples were dry and I tied plaid ribbons on the sticks. They dried darker than they were wet. Then I set the apples on my old scale so they could have their picture taken. What a clever idea! They look edible! I love the scale they are on! I found you at youaretalkingtoomuch. Adorable sitting on the scale! What a great nostalgia series you've got going on and I love the fake apples. They look so real! I'd be afraid, knowing my memory that one day I would forget they were fake and "eat" one! So glad you liked my Autumn Hydrangea Wreath! I'm picturing your husband coming home when you're not there and taking a big ole bite out of one of your very real looking caramel apples! *My pageviews are gone too. These are amazing! I can't wait to make them, thanks for the idea! Cute! 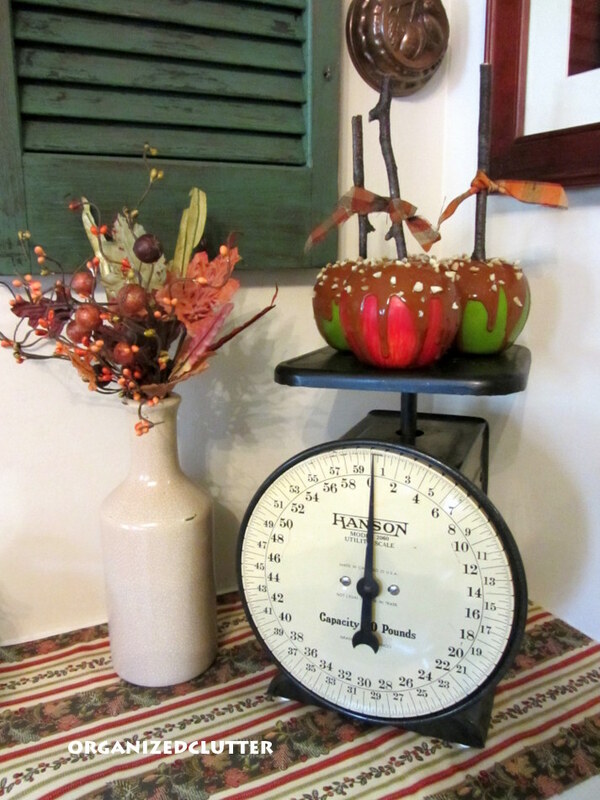 I like them on the scale! So cute!! Love them sitting on the old scale. I made several of these for my show this past weekend. Those are so cute! T really like them on the scale too! Oh my...these are just too darn cute!!! Thanks for sharing them at my linky party. I don't know how I missed this post! This is such a clever idea & they turned out so stinkin' cute! Zero calories, but they sure must make you hungry. I love that they dried darker. They are amazing! I'm finally back and have so much nostalgia to catch up on! I remember well going to my friend's house and there being sticks in the carmel bags, and then even making carmel apples as kids. So many fun memories in a simple food item! Too darn cute and creative!